If you read my first publication (wat is fuel cell site ? ), you should know approximately how works an SOFC, it’s time to see how we produce them in a laboratory for example. I’ll do it in 3 articles, one for each part of the cell : anode – electrolyte – cathode. But where do we start? Ok I give you the answer : usually, we start with the anode. But please, keep reading to understand why ! Because SOFC are made of ceramics materials which have a good high temperature resistance and ionic conductive properties. Remember that SOFC works between 600 and 700°C, it’s why we need materials stable in this range of temperature. To shape a ceramic, and be sure it will have mechanical resistance, ceramic powder need to be sintered. Sintering process is the creation of links between grains at high temperature in order to minimize their energy. It’s the phenomena used to make pottery. By creating links, grains tend to get closer to each other; it’s why the shape we made in pottery become smaller after sintering process. But each part of the cell is composed of different materials with different properties and different sintering temperature. In fact, the cathode is often made of LSC or LSCF which damage at lower temperature than materials composing the rest of the cell. It’s why the rest of the cell is sintered before the cathode, in order to protect it from high sintering temperatures. Anode is made before the electrolyte, because electrolyte must be as thin as possible, in order to lower the ohmic loss due to the transfer of oxygen ion, the thickness can reach 10um and even lower. It would be then too complicated to use such a thin film as support for the rest of the cell. It’s the reason why anode is made first, because it’s sufficiently resistant to high temperature, and is sufficiently thick to be used as support. 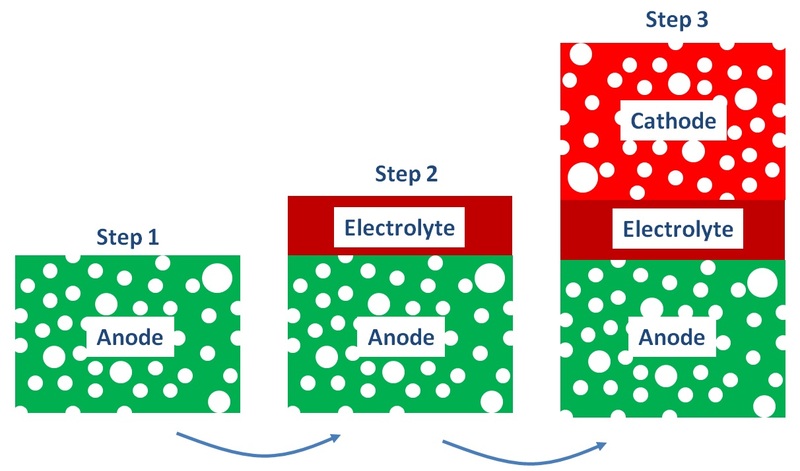 To resume, anode is made first and used as support for the rest of the cell, then electrolyte is deposed on the anode and sintered, at the end cathode is deposed on the sintered electrolyte before being sintered at lower temperature. Following articles will explain how to shape the different parts of the cell. Hi claire ! it’s interesting. I have one question. What are the components of the ceramic? Hi! your blog and this article are very interesting! It is very scientific and there good explications, so thank you because i learn many details.